European Space Agency astronaut Thomas Pesquet captured this photo of the Rocky Mountains from the International Space Station on Dec. 25, 2016. French astronaut Thomas Pesquet just took "Rocky Mountain High" to a whole new level. 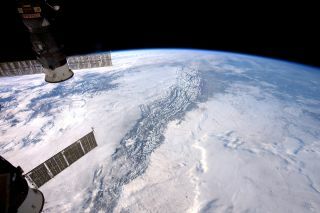 The European Space Agency astronaut took this incredible photo of the Rocky Mountains from 250 miles (400 kilometers) above the Earth at his post aboard the International Space Station. These low- to midlevel clouds appear to be of the stratus variety, forming smooth and relatively featureless sheets of dense cloud coverage at altitudes that don't quite match the height of the mountain range. Low-level stratus clouds form below altitudes of 1.2 miles (2 km), while midlevel altostratus clouds can form at up to 3.8 miles (6 km) above the Earth, according to the National Weather Service. Pesquet, a first-time space flier who arrived at the space station in November, seems to have found a new hobby in space photography, taking photos of Earth from space and sharing them on social media almost daily.